Consolidate and re-use FileMaker modules. Is there a better alternative to FMShell? Is FMShell really the best app in Applications category? Will FMShell work good on macOS 10.13.4? FMShell is the result of many modules combined into one FileMaker database. Rather than reinventing the wheel every time you start a new project, consider starting your next project with countless hours of work already completed. After all, time is money. Use FMShell, a fast, easy way to consolidate and re-use FileMaker modules. Changed Module Manager to make Startup faster. Removed ten tables, layouts, and relationships that were no longer necessary. Changed the module icons to use the Settings Globals directly. FileMaker Pro 8.5 or the FileMaker 8.5 thirty day demo. FMShell needs a review. Be the first to review this app and get the discussion started! FMShell needs a rating. Be the first to rate this app and get the discussion started! Added several custom functions for future/current use. Renamed Custom Functions to show required platform if necessary. Also renamed Functions for better organization. Many of them came from here. Changed Requirements. Must now use FileMaker Pro 8.5 since the Web Viewer and other features that FileMaker Pro 8.5 brings are so useful. FileMaker 8.5 can be purchased here. Added time to load prefs to the access log. Using this info to try to make startup faster. Changed module images to 46x46 pixels from 163x163 to make launching over Internet faster. Will also make LAN launching faster as well. Imported Holidays into Events to be displayed on calendar. Changed Progress Bar to use same window along with 'Go To Layout' rather than opening and closing windows. It's much faster and less klunky. Added a Zipcodes Database which includes the Latitude and Longitude for each Zipcode. Added a table and scripts to perform Geocoding and Address Correction using Yahoo Services using a webviewer. This REQUIRES that you register for a Yahoo Application ID which can be entered and applied for on the Settings layout. PLEASE NOTE: there is a limit to the number of lookups in a twenty four hour period which is currently 5000. Detail'. Stores previous info in ContactAddress Note field which can be seen by viewing the tooltip on the 'Address Correct' button. 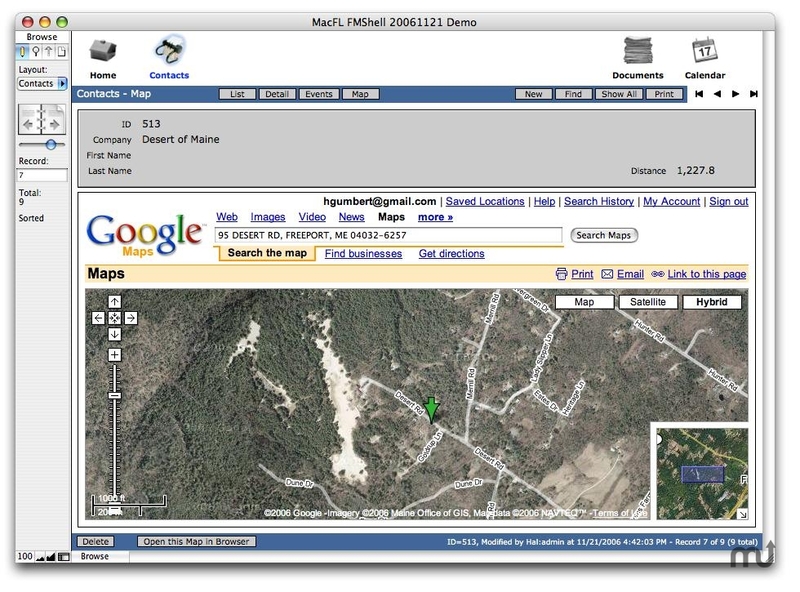 Can view the latitude and longitude by viewing the tooltip on the 'Address Label' field. PLEASE NOTE: there is a limit to the number of lookups in a twenty four hour period which is currently 5000. Added script to update a found list of zipcodes. Will update the city, state, latitude, and longitude. PLEASE NOTE: there is a limit to the number of lookups in a twenty four hour period which is currently 5000. Added Backup method that works on a local database (not running on a remote computer). The backup files are stored on the local hard drive. We try several locations storing the backup using the first available location in this order: 'User Documents Folder', 'User Desktop Folder', 'Directly in the System Drive', 'FileMaker Application Folder', or the 'User Preferences Folder'. Entering a Contacts Zipcode will automatically lookup the Contacts City, State, Country, Latitude, and Longitude. Added the Distance to the Settings Company address to each Contact in the List and Detail layouts. The distance is based on the Contacts 'Main' Address. Added sorting to column headers while in list view. Click to sort ascending. Shift-Click to sort decending.